While water borne acrylic roof coatings can be applied via roller, brush, squeegee or spray, the most cost efficient (especially for large jobs) is the airless spray. Here the coating is pumped from the container to a pump where it is pressurized to several thousand pounds per square inch. The coating is sprayed through a gun with a small orifice (usually 0.025- 0.040 inches). When the pressurized coating comes out of the gun and is at atmospheric pressure, the pressure reduction causes the coating to atomize into small discrete droplets. Typically airless spray units are characterized by their spray rate (listed as gallons per minute (GPM)) and their pressure. The number of spray guns that can be operated from the same unit are often listed. For successful roof coating spraying, the unit should have a delivery rate at 1 ½ gallon per minute and a tip size of 0.030 inches. Pressure should be at least 2,000 psi. Larger units will allow for longer hose runs. This can be helpful on large jobs where the coating and the airless spray unit can be kept on the ground and only the hose and gun are actually on the roof. Airless spray units are powered by either an electric motor or gasoline engine. While the electric motor may be less prone to the complexities associated with a gasoline engine, it may require a very long extension cord. There is an appreciable electrical current drop when the long extension cords are used. This can adversely affect the motor’s efficiency. By contrast the gasoline airless sprayer is fully self contained. There have been recent innovations in airless sprayers for home painting use, making them more affordable for the DIY’er. However, these typically have low volume and pressure, making them inefficient for applying roof coatings, where the roof coating coverage per gallon is often 30 -50 square feet per gallon, or 2-1 gallons per Square (100 ft2). By contrast, house paint coverage is typically 300 ft2 per gallon. Two units that have proven very reliable have been the Graco GH-5030 and the Graco GM-7000 pumps. A “Reverse-A-Clean” tip with a minimum tip size of 0.033” is recommended. The tip size can be increased to 0.045” for greater throughput. Asphalt emulsions are typically applied, with our without scrim or strand reinforcement, at a much higher rate than acrylic coatings, sometimes as high as 5 gallons per Square per coat. In this case, the asphalt emulsion acts as the primary waterproofer. This high film thickness can build slope and fill in alligator cracks and cover gravel ballast. In this case, much larger volume equipment is recommended. Graco, a leading airless spray manufacturer, offers two large volume units for this application, their 3060 and 1015. 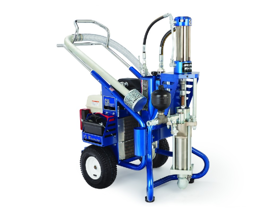 The 3060 is designed to supply coating at 3000 psi at a delivery rate of 6 gallons per minute. This is an excellent “all around” unit and can be used for applying both the asphalt emulsion and acrylic top coating. The 1015 unit supplies coating at 1000 psi at a rate of 15 gallons per minute. Note: because of the high throughput volume of these units, the asphalt emulsion isn’t sprayed, but rather fluid applied. While the acrylic coating airless spray is fully atomized into discrete droplets, the asphalt emulsion streams out in a flat, fan shaped array. To achieve this, the largest tip size should be used, sometimes as large as 3/16 inch. Looking for roof restoration information tailored towards your specific type of roof? Download one of our FREE Substrate Brochures.